The third largest city in Russia Nizhny Novgorod was founded in 1221. For many years the city was an important trade center. Nowadays it is a huge industrial center. During Soviet times the city was named Gorky after the writer Maxim Gorky born here in 1868. The Kremlin built in 1500-15 survived to our days. The Kremlin stands on a high bank overlooking the confluence of the Volga and the Oka Rivers just few steps away from the best hotels and a walking street. Stairs leading from the Volga River to the Kremlin. Stairs leading from the Kremlin to the Volga River . Inside the Kremlin there are administrative buildings, numorous monuments, gardens and some churches. To the founders of Nizhny Novgorod: Prince George and Saint Simon. Nizhny Novgorod is the place where merchant Minin and Count Pozharsky rallied a people's army to resist the Polish intervention in 1612. Both Minin and Pozharsky are commemorated in a monument in Red Square in Moscow in front of saint Basil's Cathedral. 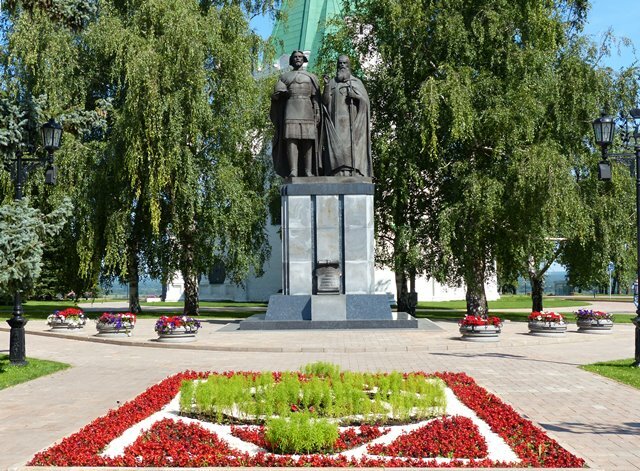 In Nizhny Novgorod Kremlin each of the Russian national heroes has a dedicated obelisk with a gilded bas-relief. The obelisk dedicated to Kuzma Minin erected in 1820. The obelisk dedicated to Count Dmitry Pozharsky. Next to the Kremlin there are monuments to the two outstanding Russian pilots. The first one is Peter Nesterov - father of modern aerobatics. Back in August 1913 he performed a loop in the air. This flight maneuver is still called Nesterov's or dead loop. The second one is Valery Chkalov. In 1938 his aircraft took off in Moscow and 63 hours later landed in Vancouver having flown over the North Pole. 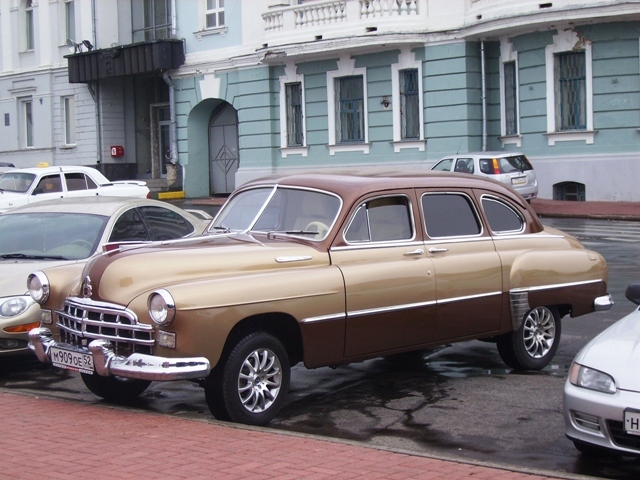 Nizhny Novgorod is a center of the Russian automobile building industry. A big collection of motor vehicles ever produced by the local automobile building factory is on display. A hit from the 50-s.
One of the main attractions is the Makariev Monastery founded in 1453. The buildings and walls we see today were built in 1651-67. Currently the Makariev Monastery is a convent. About 30 nuns live, work and pray there. The monastery and surrounding village thrived on vibrant river trade through the 19th century. The famous Makariev Fair took place every summer under the walls of the monastery for more than two centuries. The fair was one of the largest in Eastern Europe. Merchants from Europe and Asia arrived in July to exchange goods. By 1800, there were over three thousand state and privately owned warehouses near the monastery to keep goods millions of rubles worth. In 1816, a huge fire destroyed most of the buildings and those millions were lost. In 1817, the fair moved to Nizhny Novgorod. Old fashion way to rinse laundry is still practiced in the village next to the monastery.